I awoke several times throughout the night to the sound of the rain beating on our tent from above. I had foolishly hoped that the unseasonably warm spell we had had the prior week would stick around. But as a native Pacific Northwesterner, I know better than to believe such nonsense. Everyone knows the official summer starts after the 4th of July. 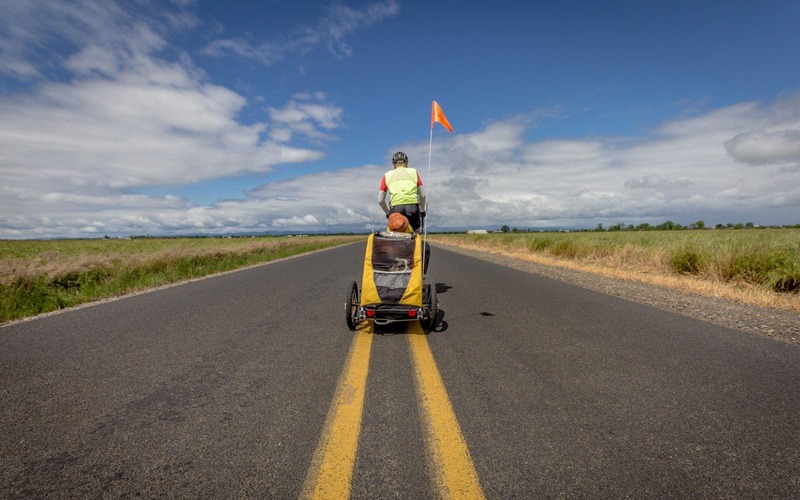 Over the next several weeks, we would be getting to know our own state by cycling from Portland to Eugene, then on to Bend, and back to Portland via Detroit, hitting three of the Oregon Scenic Bikeways along the tour. Having just returned from two years traveling across Europe and South America by bicycle with our dog, Sora, I wasn’t sure that I was ready to be back in the saddle. Our time in the Pacific Northwest was limited, however, and I wanted to see as much of my beloved Oregon as possible. 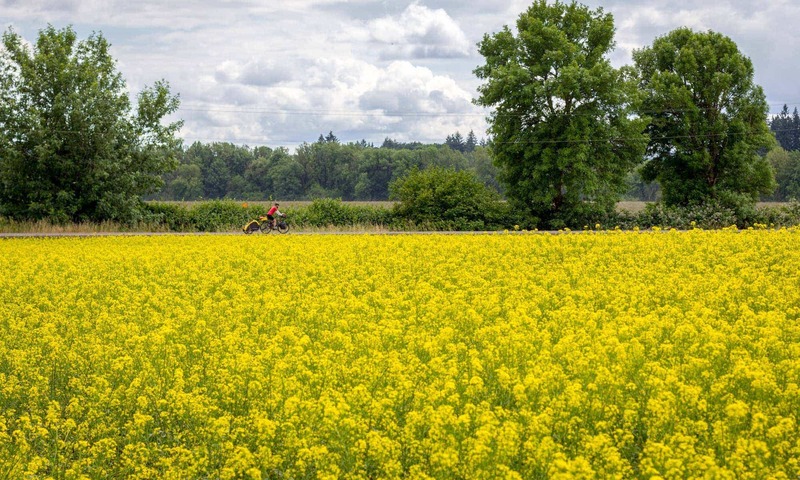 The beauty of Portland is that one can literally depart from their front door and make the day ride to Champoeg State Park, where the 134-mile Willamette Valley Scenic Bikeway begins. We departed early, our destination Salem, 40 miles south from the Champoeg State Heritage Area. Passing storms dropping heaving rains would require us to stop frequently to don all of our waterproof gear, only to have to take it off a few minutes later. I rode most of the miles in my winter set up: waterproof gloves, booties, rain pants and jacket. I wished I had had my buff to cover my numb chin. The rains caused our surroundings to glow a brilliant green. In the lushest part of the state, this meant that the hops fields, vineyards, berry patches and hazelnut groves shone as they drank nature’s bath. 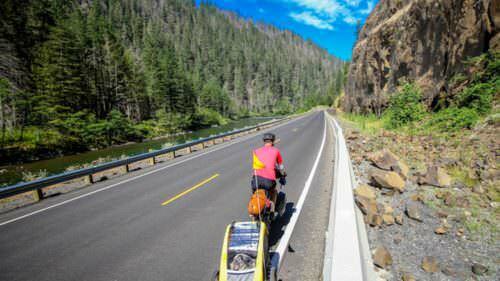 Navigating the Willamette Valley Scenic Bikeway was a breeze. Signs pointed out turns along the entire route and directed us through Salem along neighborhood roads, easing the usual stress of attempting to navigate an unknown city on bicycle. Just before reaching our B&B, we happened upon the dog-friendly Salem Saturday Market and stopped for lunch, swallowing our last bite before the leaden clouds ahead let loose. Jean, our hostess at Century House went above and beyond to accommodate our bicycles, Sora and our vegan diet. An avid cycle tourist herself, she knew our needs well and made us feel right at home. Breakfast was a treat: a huge fruit salad topped with coconut cream, a green smoothie and a quinoa porridge bowl with toast and local jam. Knowing we had a long day ahead, she sent us off with bellies filled with foods that would last the journey. The rains seemed to dissipate and we were gifted a partly cloudy day for the journey ahead. Our first stop was Ankeny Vineyard, located right on the route. The beautiful grounds overlook the Ankeny National Wildlife Refuge, and Sora was welcomed inside as we sipped wine and ate lunch. 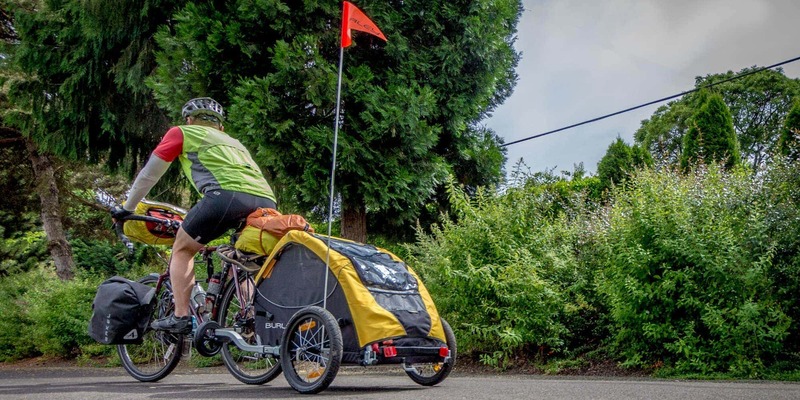 We veered slightly off the bikeway to cut off 15 miles by taking the Buena Vista Ferry, where we met several riders out for the day who chatted with us about routes to Corvallis and asked about our travels with our Sora. We arrived in Corvallis around 5 p.m. and went to our hotel, the Holiday Inn Express, overlooking the Willamette River. Our luxuriously cozy bed begged us to retire for the evening, but we had beer to drink. We never pass the chance to eat and imbibe at one of our favorite breweries, Block 15 Brewing. With plenty of vegan options and too many delicious beers from which to choose, we fueled our bodies after a long day and walked back to our hotel along the waterfront path. The short leg ahead left us with time to see a bit more of the city. Becca, from Oregon Wine Country, took us to Peavy Arboretum in the McDonald Forest just outside of town so we could give Sora a longer walk and visit some of the nearby natural areas. Corvallis is a darling college town decorated with colorful flowers and bike lanes on just about every street — we were a bit sad to not be able to stay longer. We picked up bahn mi sandwiches from Baguette and packed our bags to head out for the day. The ride to Brownville was flat, fast, and easy, though with our respective illnesses, it felt like a slog. We pedaled alongside bee boxes, where I marveled at their work while getting into one another’s paths as we rode past. Made famous by the film “Stand By Me,” Brownsville is a pioneer village with vintage charm. Seventeen hundred people call the town of Brownsville home. The town opens the quiet and peaceful Pioneer Park to cyclists for overnight camping. Before leaving Brownsville, be sure to stop in at Randy’s Main Street Coffee. You won’t regret it. With the toughest climb of the ride ahead, we geared up and set off on our final day on the Willamette Valley Scenic Bikeway. The skies cleared soon after and we even spotted some blue above as we eagerly made our way to what was perhaps our favorite stop on the bikeway: Agrarian Ales. Located on the longtime family farm, you won’t find traditional Pacific Northwest hoppy IPAs served from the taps here. That’s because Agrarian grows 100% of the hops used in their beers. Agrarian is what you would call a true farm-to-table brewery. 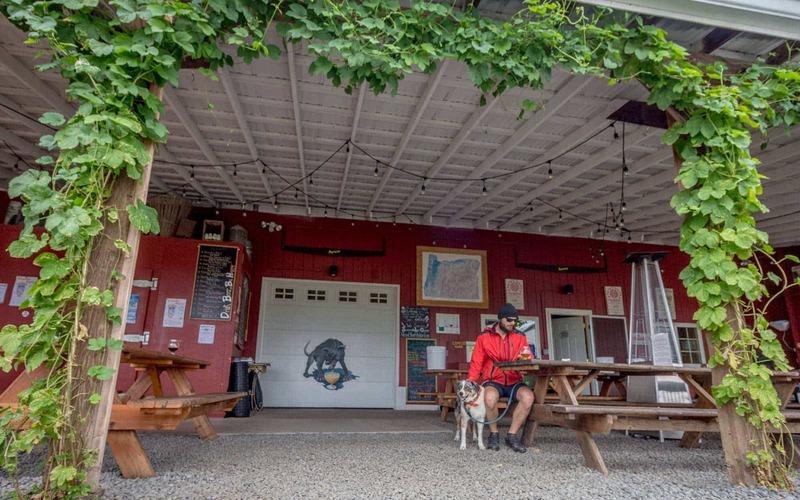 Much of the food served out of the restaurant is grown on the property and that which is not, is purchased from the farmers’ market in nearby Eugene, used to make one of the best pizzas in the Willamette Valley. 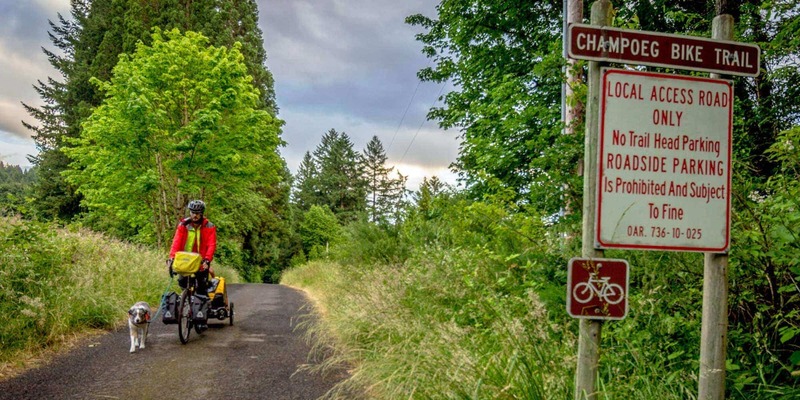 A short ride away, we spotted our last bikeway sign directing us into Armitage Park Campground, a stunning 57-acre park situated alongside the McKenzie River, complete with a two-acre dog park. 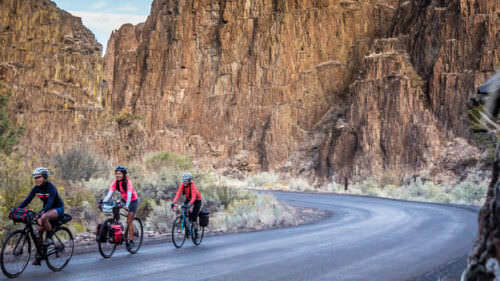 It was bittersweet to complete the Willamette Valley Scenic Bikeway — we couldn’t believe it was over. 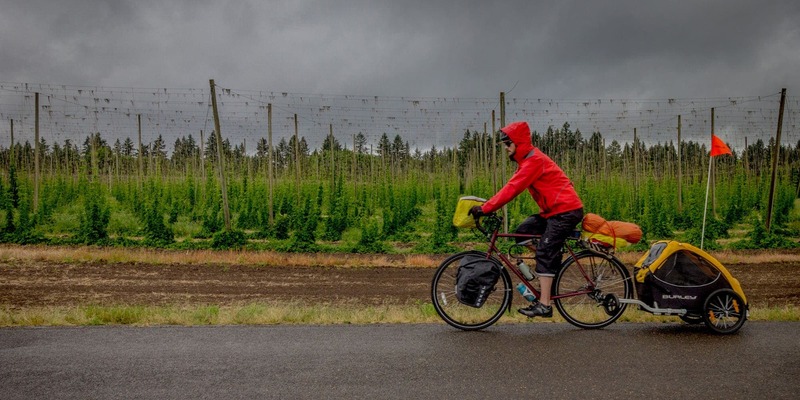 As the longest and flattest of the three Oregon Scenic Bikeways we would tackle, the Willamette Valley Scenic Bikeway proved to be a beautiful starter ride before hitting the more challenging McKenzie Pass and the Cascading Rivers Scenic Bikeways. 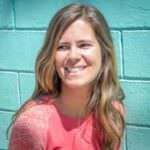 Jen Sotolongo is the storyteller and photographer behind the adventure travel blog Long Haul Trekkers. 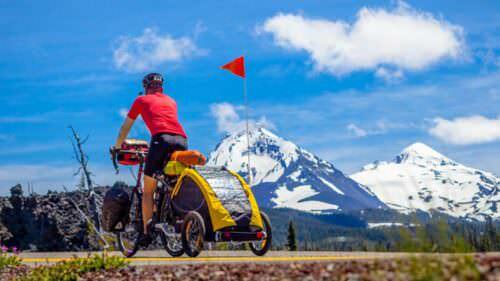 From 2015-2017, Jen traveled the world by bicycle along with her partner, Dave, and their dog, Sora, a rescued Australian Shepherd. 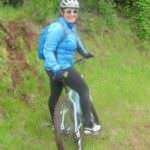 When she's not adventure cycling, you can find her running long distances in the woods or hiking in the mountains. You can follow her on Instagram @longhaultrekkers.